I don't get excited by new thing very easily. OK. That's a lie, but let's pretend that I don't, so my next announcement sounds all the more amazing. I'm very excited by what I'm seeing over here on the e-bike front. 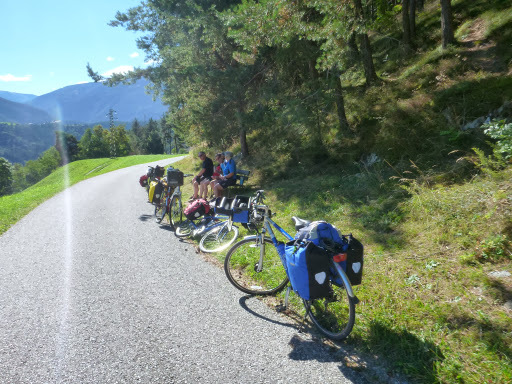 If you've been following my European posts you'll already know that I've found the old school four panniers and a handle bar touring cyclist to be a very rare beast over here. Yep, I'm old school nowadays. 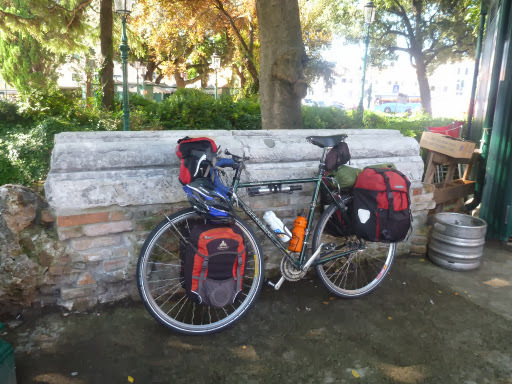 There's still plenty of cyclists going around with a couple of panniers on the back, and I've even seen a few homemade bikepacking rigs. But the real explosion since I was last here In 2008 has been in e-bikes and e-bike touring. It's not uncommon to pass numerous cyclists touring around in casual clothes on a good, German engineered and built, e-bike. It seems every town now has bike charging stations, or rental shop's where you can just swap out your depleted bike for a new one and carry on cycling. 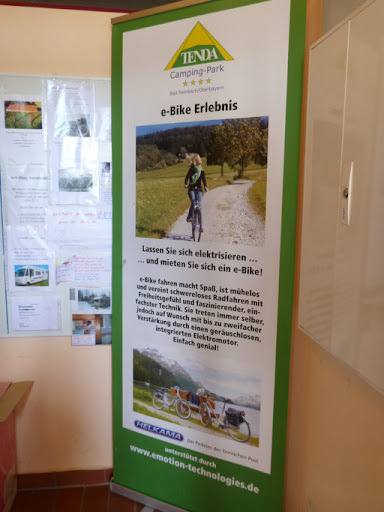 Major cycling routes such as the Tauern Radweg and the Bodensee Konigssee Radweg provide maps with charging stations shown on them, and you can organise self supported tours, or just download free maps and brochures and do it yourself. I've even noticed that some of the mountain bike resorts in France are offering e-MTB options for those who want to get away from the lifts ... but don't want to do all the hill work themselves. And the impacts are amazing. 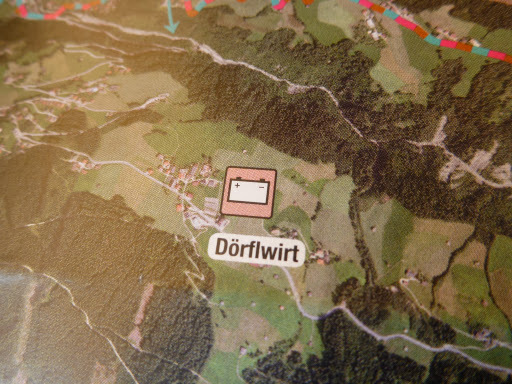 You don't pass the fit, young, adventurers you might expect to be out touring. 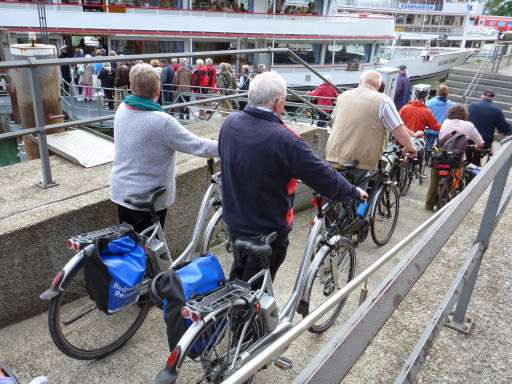 Most of the people I'm passing are retirees enjoying organised tours on their e-bikes. And boy can they go. I recall being half way up a 1,600 metre pass, covered in sweat, quietly dieing in a bus shelter wondering "Why am I doing this?" when this old gentleman wearing a cotton shirt and shorts, whooshed past uphill without even breaking a sweat, and I thought to myself then. "That's my 50th birthday present to myself, right there." More seriously, it's had me thinking again about the Light Railway Project in Hobart and wondering why instead of spending well over a hundred million dollars to essentially put a railway back in next to a biketrack that can only serve a very limited pool of people, aren't we looking at what to me is a real commuter alternative ... A metro e-bike system around Hobart starting on the bike track (noting that the two aren't mutually exclusive). Door to door it would be faster and much cheaper than a bus or light railway, the solution can run anywhere a bike can go (not just limited to the railway line), you can leave home (or work) when you want to not to meet a timetable, it substantially gets rid of hills (but unfortunately not rain), and allows you to stop on the way home to get some groceries. What's more it's more appropriate to our populatiopn density and it would probably cost a fraction of the cost of a light railway and is infinitely scalable to other areas around the city and State. Given that I saw in the light railway business case that it costs an average of $5.25 per trip to move someone on our metro system, I'd think that a Metro E-bike system would have a very positive cost benefit ratio. And that's why I'm so excited. Now all I need to do is convince all you Tasmanian's that this is a good idea. DISCLAIMER: This is just a bit of 'on the bike thinking' which you'll notice I've been doing a lot of over the past few weeks. It's purely me thinking out loud.